Over the years, much has been written regarding the principles of leveling, and how to get material flat. In addition to simply getting material flat, more recently there has been a greater emphasis placed on developing technology to assure the material stays flat after subsequent processes such as laser or plasma cutting, welding, and/or other various forming and fabricating operations. All too often, material that appears to be flat doesn’t stay that way. Today, we understand that this is primarily due to the existence of randomly trapped internal stresses. While a flat piece of material may appear to be relaxed and at rest, in reality there is often a “tug of war” of epic proportions being waged right before our eyes. Trapped internal stresses can be introduced in a host of areas or operations. Typically these random stresses are at least in part initially introduced at the mill during the rolling process. Some portions of the strip are worked more than others. In addition, as the material cools, the outer wraps of the coil will cool at different rates than the inner wraps. Subsequent exposure to significant temperature changes can also induce additional changes in the material, such as coils that are stored in a heated environment, shipped during the cold winter months, and subsequently allowed to warm in the next facility. Because the material expands and contracts at different rates, additional stresses can be introduced. The leveling process itself, while having the ability to produce flat material, can also induce randomly trapped stresses. Because no one single process or condition is solely responsible, trapped internal stresses and their consequences are inevitable. While there is a general understanding and acceptance regarding the common principles of leveling, there is considerable debate as to how or if one particular type of Leveler or leveling process is really better than another at specifically addressing the problem of trapped internal stresses and spring back in addition to simply producing flat material. Understanding this tug of war will ultimately reveal clear commonsense reasons as to why some systems are clearly more effective than others. 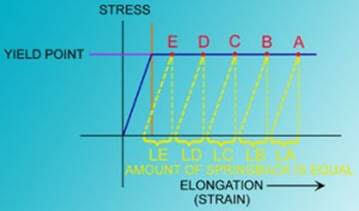 While flatness is frequently referred to as a side to side length differential, that is, some portions of the sheet or strip are literally longer in some areas than others, trapped stresses could be described as some portions of the sheet being under tension while other portions are relaxed as illustrated on the stress-strain curve. The portions of the strip labeled C & D are under tension. While flatness and stresses are both clearly related, each problem is unique and must be addressed as such.For leveling, the most important and key issue is the importance of exceeding the material’s yield point in order to affect permanent change in the material. Once you take the material past the yield point, everything before that is forgotten. While this is the basic key requirement for producing flat strip, it is also the key to producing flat material that stays flat. While the material may appear to be flat and at rest, portions of the strip are hung up on the stress-strain curve and are actually under tension. In order to get material flat, it is necessary to selectively elongate portions of the strip. If some sections of the strip are longer than others, the only way to get the material to lay flat is to sufficiently elongate the short portions lengthwise to “dimensionally equalize” the material. The goal is to make the strip dimensionally the same length across its entire width. 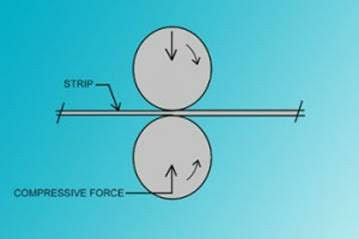 In order to eliminate spring back, the strip must be “stress equalized” by elongating the material’s entire cross section, top to bottom, and side to side, past its yield point to erase its previous memory. As a result the randomly trapped internal stresses are made into consistently trapped stresses; that is, all the material is allowed to spring back consistently to the same point on the stress-strain curve. Consequently in order to produce flat material that stays flat, it is necessary to both elongate portions of the strip more than others to dimensionally equalize or flatten the strip while also elongating the entire strip enough to exceed the yield in all of the material to stress equalize the strip. Consequently it is important to note that it is possible to stress relieve material without necessarily getting it flat. Conversely it is possible to get material flat without eliminating trapped internal stresses. Roller Levelers bend the material progressively up and down over rolls of sufficient diameter to stretch the outer and inner surfaces of the material past the yield point. The smaller the roll, the more yielding top to bottom that will occur. The farther the outer surfaces are from the central or “neutral” centerline, the more yielding that will occur. The “neutral” centerline or fiber is an imaginary line or area in the middle of the material’s cross section which neither stretches nor compresses during the bending process. As a result, the material in this neutral area never exceeds its yield point. A Roller Leveler also has the ability to selectively stretch the material from side to side. Roller Levelers incorporate individual backup roller flights or banks that can be vertically adjusted so that the work rolls can be bent during the leveling process. By deliberately bending the rolls, portions of the strip are forced to take a longer path through the machine. As a result, some portions of the strip relative to length are permanently stretched longer while other sections are stretched very little or not at all. The sheet illustrates a part before leveling. The stress-strain curve illustrates which portions of the sheet are stretched first and the greatest amount while also indicating the portions of the material that have not been stretched past their yield point. It is also important to note that although portions of the strip have exceeded the yield point, much of the strip has not. Therein lies the problem. While the strip may be dimensionally equalized and allowed to lay flat, portions of the sheet are still in tension, unable to relax. Portions of the strip are in effect “hung up” and still under tension. Although it may appear as if the strip is at rest, portions of the material are actually under tension and being held in place by the surrounding material. Once released by shearing or cutting the material, these areas will simply spring back to their original often out of flat condition or shape. Today heavy duty Roller Levelers are being promoted as being able to equalize stress. While these units can certainly work the material much harder than conventional Roller Levelers, they cannot exceed the yield of the material throughout the entire thickness of the strip by simply bending the strip over a series of rolls. Nor can they assure that all the stresses in the material have been equalized side to side. Both are essential to producing low stress material. All Roller Levelers are also sensitive to incoming material shape. There is a limit to the amount of shape correction that can be expected by virtue of the amount of roll bend that is possible. Today, companies frequently use Temper Mills in Cut-To-Length Lines to produce stress relieved material. As previously discussed, in order to eliminate randomly trapped internal stress, all the material must be elongated or stretched beyond its yield point. A Temper Mill does this through the use of compressive forces. By squeezing the material between two rolls with enough force to reduce its thickness, the strip is slightly elongated. The typical amount of elongation is only 1 or 2%. Although most Temper Mills have the ability to elongate the strip further, doing so can change the material’s properties significantly. Consequently, some end users will limit the allowable elongation their processor can impart due to these changes. While a Temper Mill is often associated with producing flat material, to the contrary, the Mill by itself will not necessarily get the material flat. By squeezing the material between two rolls with enough force, the strip is slightly elongated. Although the Mill elongates the entire cross section of the strip, the amount of elongation is essentially the same. For the most part, a Mill cannot selectively elongate the strip which is required for shape correction. As a result, it is possible to stress relieve material without necessarily getting it flat. Conventional Roller Levelers must still be used to flatten the material. This is why you will always find Roller Levelers being used in conjunction with a Temper Mill in Cut-To-Length Lines. However, by virtue of the roller leveling process, stresses can be reintroduced into the strip, and you can “undo” the benefits of the Temper Mill. If the Mill works the strip too hard, it will actually induce shape problems. If the Roller Leveler works the strip too much, the benefits of the Mill will be diminished or eliminated. This system is also sensitive to incoming strip shape. The old saying “junk in, junk out” is still true. 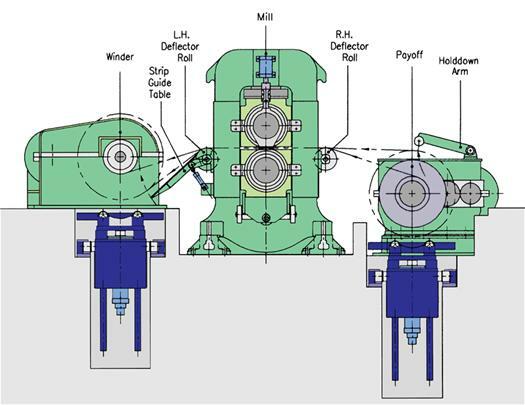 While the combination of the Temper Mill and Roller Leveler will produce flat stress equalized material, the two systems are reliant on one another. In addition, the combination is still limited by the capabilities of the Roller Leveler relative to the severity of the incoming shape that can be corrected and the skill of the operators. Unlike conventional Levelers, no bending is used as part of this leveling process. In-Line Stretcher Levelers operate in conjunction with a Cut-To-Length Line. The strip is first stretched and then subsequently cut-to-length to a specific sheet or blank size. An In-Line Stretcher Leveler consists of a pair of entry and exit frames. These frames are adjustable relative to the desired part or stretch length. When required, each frame grips the material across its width. Large hydraulic cylinders connect the two frames. When pressurized, these cylinders push the frames away from one another. 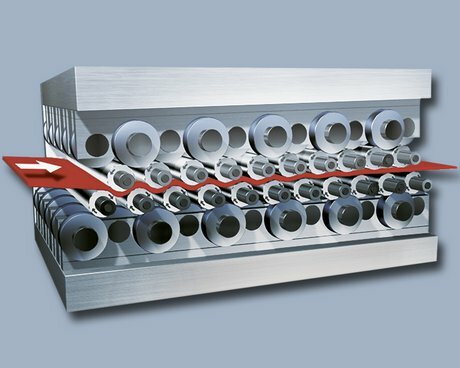 The pressure exerted by the cylinders exceed the collective yield of the material (thickness x width x yield), and the strip is subsequently stretched in the direction of travel. The Line’s Feeding System pulls the material through the Leveler incrementally. Between each Feed cycle, while the material is stopped to be sheared, a portion of the strip is stretched. While some portions of the strip are stretched more than others, all of the material has exceeded its yield point and will “spring back” consistently. In addition to the material being sufficiently elongated lengthwise to exceed the yield point in all of the material, top to bottom, and edge to edge, by virtue of the process, portions of the strip are stretched more than others at the same time. In effect, the material’s entire cross section is stretched to a common length or distance; that length being sufficient to both dimensionally and stress equalize the material at the same time. No subsequent processing is required. The end result is material that is more homogeneous and consequently more stable than with other forms of leveling. While stretcher leveling is one of the oldest and most effective types of leveling ever developed, there is a limited understanding as to how the process works. Typically, there are concerns that the process works the material significantly more than with other types of leveling. Consequently, similar to the Temper Mill, if the material is overworked, this will change the properties of the material. However, while a Temper Mill may elongate the strip 1 or 2%, a Stretcher accomplishes its work with typically only .3 to .5% elongation. Relative to the percentage of elongation required to do its job, the Stretcher has very little impact on the metallurgical properties of the material. In regard to shape correction, if material has an edge wave or center buckle, the strip is longer in this area. Consequently, the short portions of the strip must be elongated to somewhat equal the longest length to allow the material to lay flat. However, regardless of the method used to elongate the strip, each system would need to elongate these areas essentially the same amount to achieve flat material. As a result, the percentage of elongation would be comparable. The Stretcher Leveler performs more overall work due to the fact the entire thickness of the material is elongated. However, no specific portion of the strip is worked more than with any other type of leveling process in order to achieve similar results. The Stretcher is relatively simple to adjust and operates with minimal skill. If the material is not flat, the operator simply increases the amount of stretch until the desired results are achieved. As long as the material lays flat, trapped internal stresses will also be consistent. Stretchers are also far less sensitive to incoming shape. Because Stretchers do not rely on the use of rolls, the ability to level is not limited by the amount of roll bend that is possible. As a result, the finished product is virtually independent of incoming shape. Today, a number of companies offer systems that are promoted as producing temper passed or stretcher leveled “quality” material; however as to whether these systems actually achieve similar results are questionable. While there are a number of options available for leveling flat rolled material, each has their own inherent limitation. Consequently, in order to achieve the best possible results with a particular application, it is important to know the limitations of each machine.